New Jersey Turnpike (North or South) - Take the New Jersey Turnpike to Exit 11 (Garden State Parkway turnoff). 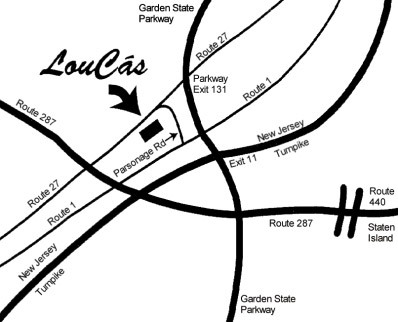 Take Garden State Parkway North to Exit 131 (Not 131A or 1311). Turn right onto Route 27 South. Proceed to fourth traffic light and turn left onto Parsonage Road and right into parking lot of Colonial Village Shops. Garden State Parkway (From the North) - Take Garden State Parkway to Exit 131. Turn right onto Route 27 South. Proceed to third traffic light and turn left onto Parsonage Road and right into parking lot of Colonial Village Shops. New York - Take George Washington Bridge directly into New Jersey Turnpike (See Above). Route 287- Take Route 1 North. Turn off at Parsonage Road jug handle. Proceed to just before 4th traffic light and make left into parking lot of Colonial Village Shops. When in Milltown, visit Fresco Steak & Seafood Grill! Serving an exciting menu full of fresh sea fare, steak, veal and chicken with choices for every palate. The 160 person dining room is lavishly decorated providing the perfect atmosphere for a private party or an evening of relaxed and casual fine dining. We also have an extensive banquet menu. When in Old Bridge, visit Ponte Vecchio Italian Seafood Grille! Ponte Vecchio is the latest collaboration from the LouCas family of restaurants. This Italian seafood grill specializes in serving the finest seafood, along with the best traditional Italian cuisine.